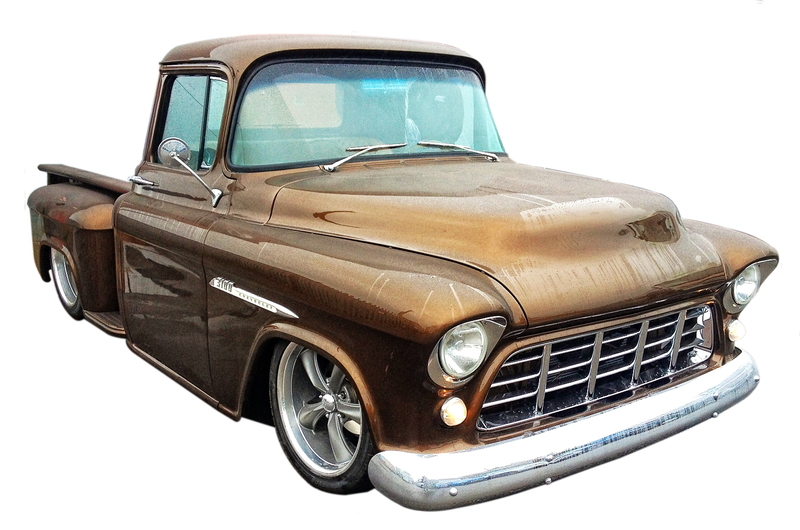 As you can see by the photos this truck came to us as a stripped shell, some of the rust work was complete and it had been blasted. The time consuming thing about old American trucks is that the metal is a very heavy gauge, it is so much thicker than most other manufacturers. Making repairs to a rippled door for example which usually may take a day can be more than double the man hours. Also with these trucks being 50 year old farm and utility vehicles they have lead a hard life! 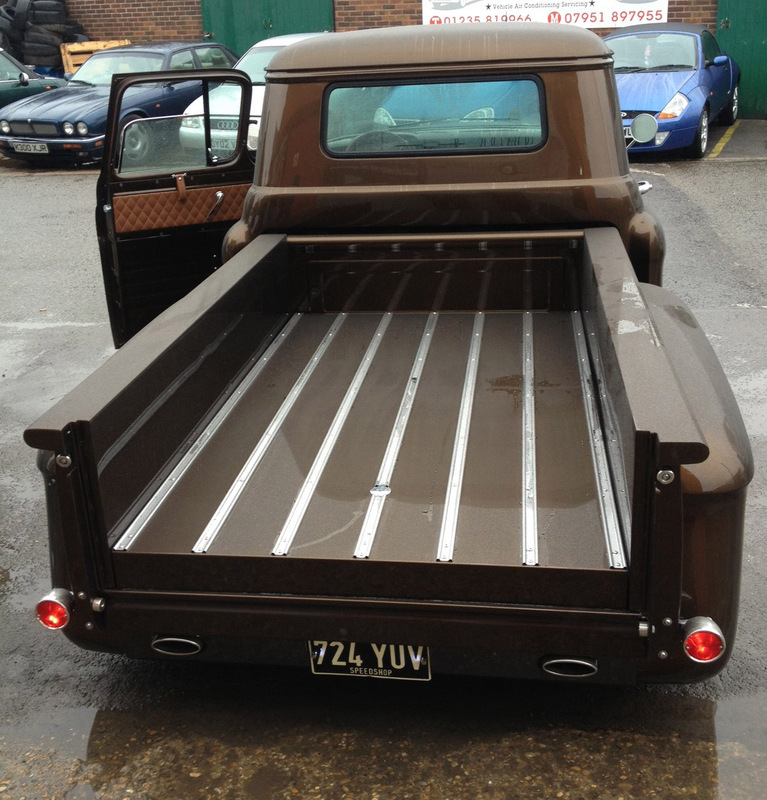 The truck also had a custom bed and the chassis had been cut in a ‘Z’ shape. 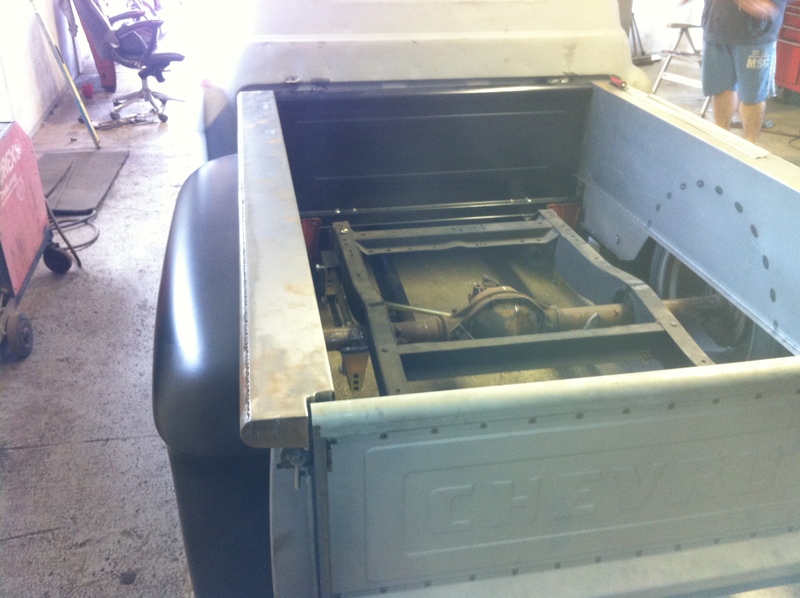 This is to allow the air ride kit that was fitted to drop the cab and bed down as low as possible. 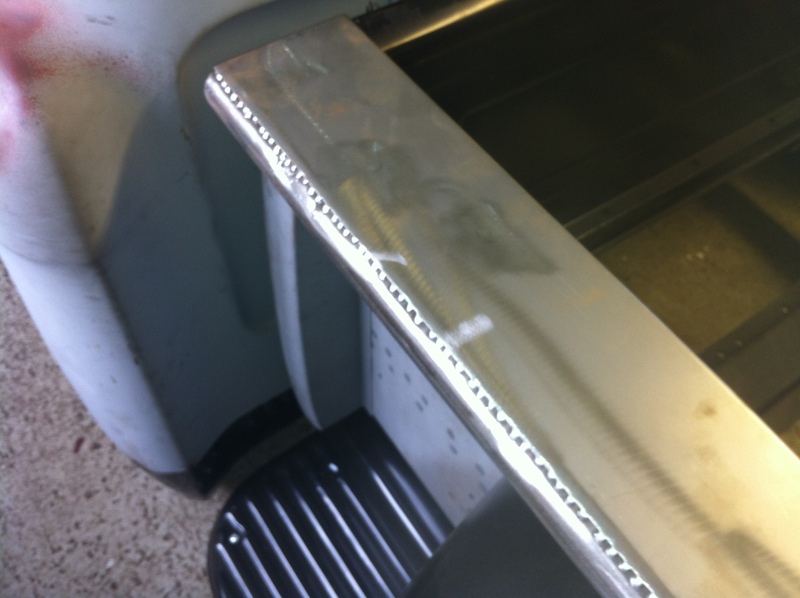 The bed sides however had been welded with flat sheets to give that smoothed off look, this was a great feature but getting those huge panels to be flat and straight was a huge challenge. We spent weeks on those parts alone, in the end they looked amazing. Turning this one into a stunning shiny truck with razor sharp lines and good door gaps was a tough challenge but a great achievement. 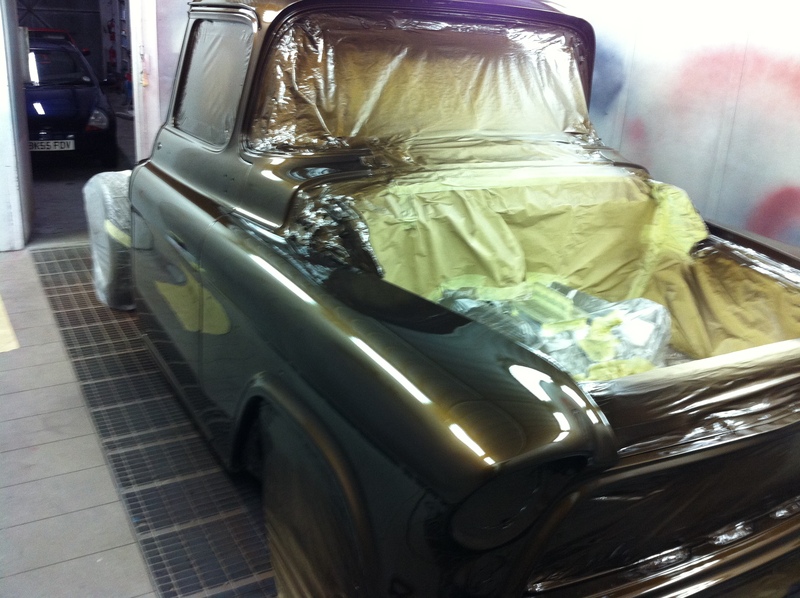 The truck needed to have a ‘show’ finish and we were very excited about doing it. The work took around 850 hours. A huge amount of this time was the panel fit and dent removal. 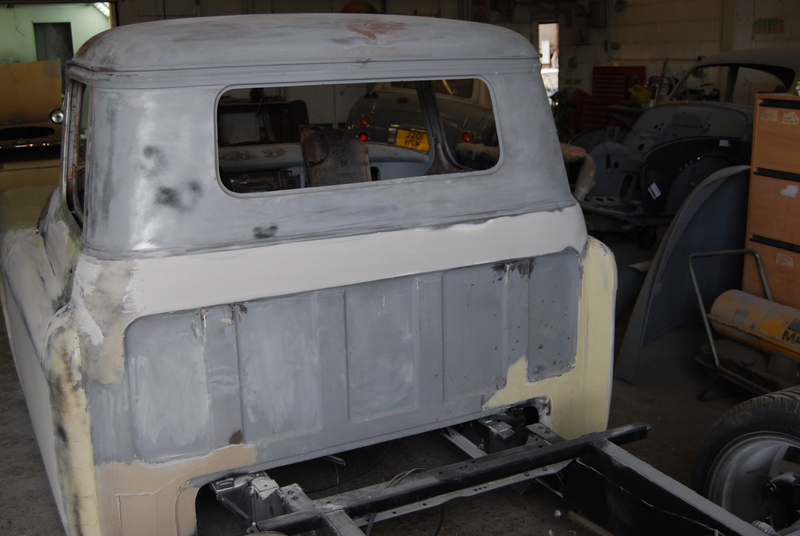 To start with the doors wouldn’t even shut at all, let alone enough for us to start to improve the panel gaps! 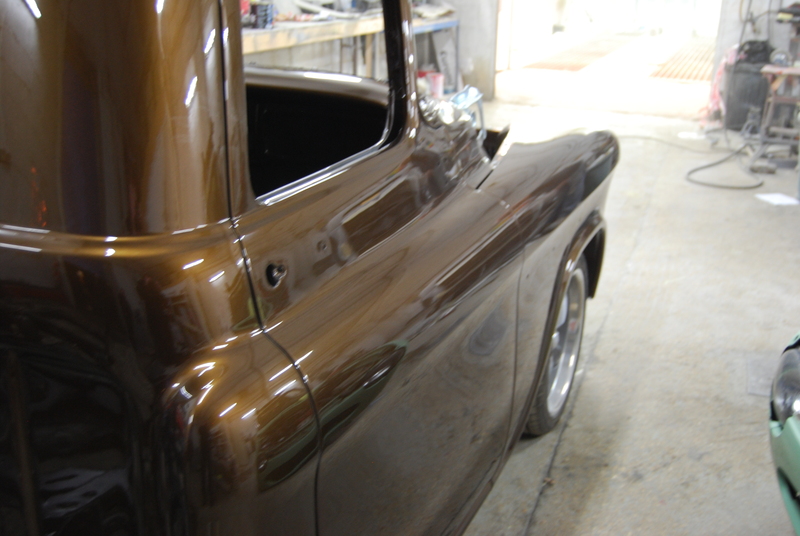 At one stage we had to use a pneumatic power arm to reshape the driver door window frame. 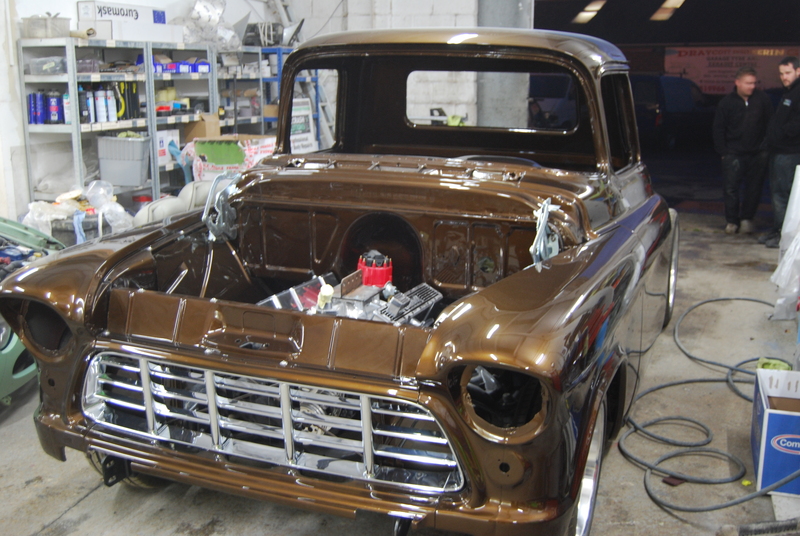 With regards to the paint we tested a number of manufacturers to find just the right amount of ‘Pop’, we wanted to get a depth of finish with just the right level of brown/gold effect. In some brands the paint was a little to brown but we think we settled on a great one in the end. 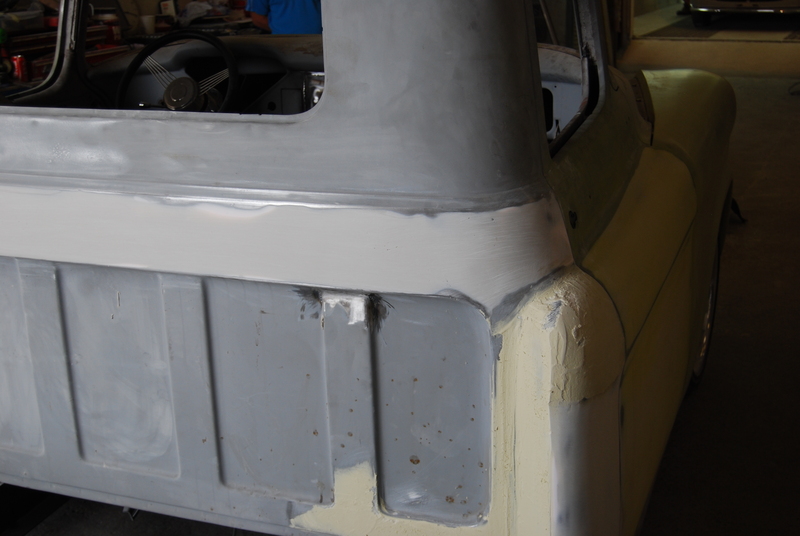 We used a tested process of filler primer which gets the panels those ‘sharp’ lines and depth of finish. This means that we are preparing the car 6 times before we even think about putting any colour on. We start off with an etch primer, go on to fillers and then stoppers, use polyester primer twice and then re coat in a 2 pack primer. Only after this we use a wet on wet primer and finally after this we use a water based colour coat for the stunning BMW Marrakesh metallic brown. 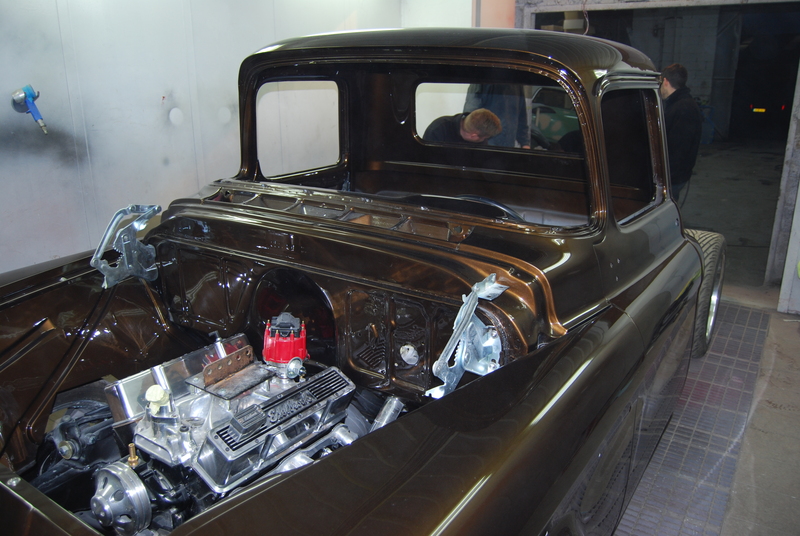 Then plenty of lacquer and a lot of polishing! I think all in all our painters spent 5 days polishing, in the end it was well worth it. 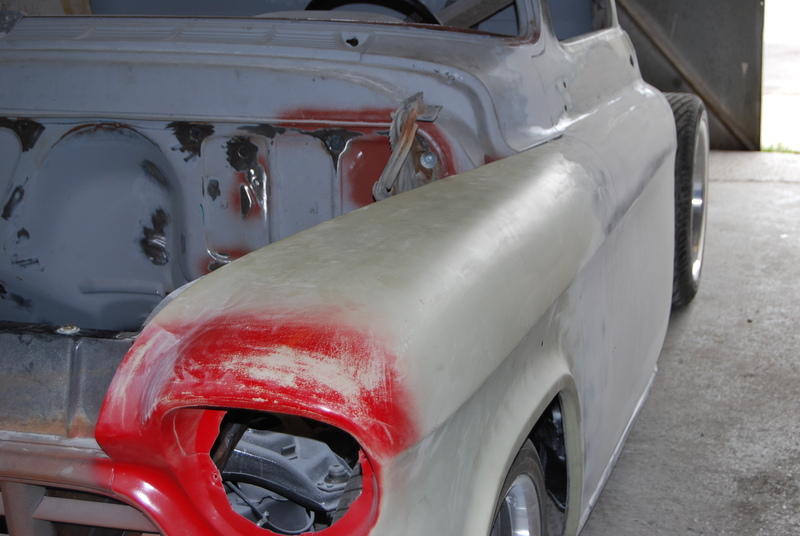 As you can see in the video Custom Car Magazine called the paintwork ‘Sublime. 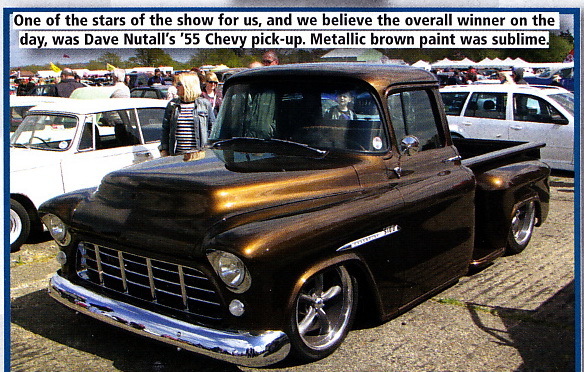 The truck won ‘Best In Show’ in the 2014 Wheels Day show. There were over 2500 hot rods. Again a tough job but this is where we excel. Let us help you with your project. In fact, we would even just love to see it so why not send us some photos or come in and let us see what you’re up to?